This buttercake recipe was given to me by my aunt. I have since shared this recipe with so many people and the feedback is always very good. I shall post this recipe as my first recipe posting in my own blog. 2. Beat the butter with the caster sugar until white and fluffy. Add in eggs one at a time and mix well. Then add is vanilla essence and evaporated milk and mix well. 3. Lastly fold in sifted flour into the butter mixture and mix well. Pour into a greased and lined cake tray and bake for about an hour. Lee Lee, indeed two thumbsup on your good recipe for butter cake! Thank you and keep more recipes coming. Lee, your buttercake is superb! A must keep recipe. Ur recipe really a keeper. I bake it as new year gift, about 8 cakes. All my friends loved it. Thank u very much. This is the perfect butter cake, a keeper for me too. Lee Lee, you are just soo generous to share this recipe, thanks! I made this cake and it was delicious. My dh and I love it! Thank you so much for sharing this recipe. I have a question. After baking, the top of my cake was light yellow and not golden brown. I was afraid to bake longer as the inside was cooked. Is this normal? Thank you. It is normal as different oven differs in temp settings. If you want it a little brown no harm baking it for another 5 mins or so. I tried baking the cake last Saturday and it turned out well. However, the top of the cake crack. Why is it so? I have tried your butter cake recipe yesterday. I must say your recipe turns out really well. Very nice. I will use this recipe again and again. Thanks for sharing this wonderful with us. Hi jthorge, nice to hear from you. How is the little one? Must be big already. Yes. My bb is coming to 13 months old. Very active and restless! haha! he's really a handful. Luckily my daughter is able to help me for a while, so that I can bake some cupcakes. Whenever I see your bakes, it always make me drools. Thanks again. I tried ur buttercake recipe a couple days ago. Wow,its reaaaaa....lly good! Taste A+ , texture A+ , not too oily, not too sweet. Just Perfect! My only regret is I wish I tried it sooner - this recipe has been in my TO-DO-List for too long! Thks for sharing this wonderful recipe. Being a new baker could you tell me how I would know whether 1/2 cup evaporated milk is enough or when I should add more? 1)I whisked the butter/sugar instead of creaming. When the 4th egg was dropped into the batter, it started to cuddle,had no choice but to continue adding the 5th/6th eggs into it. Before I fold in the flour, could see layer of water forming at the base of the batter. (IS IT EGGWHITE ?) I just went ahead with the folding of flour into it. Next nightmare, until yr set temp is abit on the low side 160C... My cake was still watery even though already in oven for 50mins. 1 hr later, I opened the ovendr but the center still wet. Finally I took abt 1 & half hr for the cake to actually fully baked.. the result texture was crumpy and top surface bit crack,brown and hard. Oops! Real nightmare for me baking this cake. I just don't hv luck baking butter cake. Any reasons you can advise me. Thanks. Hi Catherine, so sorry to hear of your not so pleasant experience with the buttercake. For me I also have the same problme of my egg mixture curddling when adding the last two eggs. I just add in my flour and mix it and it will be ok. I don't know if the mixing of the sugar and butter timing is a factor for the water forming at the base for you. Also, if you think the temp is too low, you may up it by 10 to 20 degree and bake it but just watch out for it. Hope you have better results the next time round. Thanks for yr prompt reply. 1 cup is about 250 ml. Hi Adeline, take out the same amount of flour from the recipe to be replaced by cocoa powder. That means, if you are using 30g of cocoa powder you take out 30g of flour from the original recipe. Follow all the steps to the part where you add in the flour to the butter and egg mixture. Divide the batter into two portion, add the cocoa powder into one of them. Pour some white batter into your baking pan, alternating with the cocoa batter. Use a skewer or cake tester to make swirl pattern to get the marble effect. I baked your butter cake on Tuesday night. When we eat it yesterday I find the cake too dense. Wonder if it is due to the low baking temperature cos my cake took 1.5hrs to be fully baked. After 1hr it is still wet inside. May i ask if the butter need to be in room temp? or use the hard one directly out from fridge? Hi Chezzyheart, the butter can be semi-hard. As for a compact butter cake, as long as you have enough liquid in the recipe, the cake shouldn't be crumbly. Tried your buttercake recipe. It's so yummy. Will definitely bake this again. May I know how to estimate on whether I shld add 1/2 cup or 3/4 cup of evaporated milk? If you want your cake very moist then 3/4 cup of milk, if just moist than use 1/2 cup. A yummy butter cake comment from my family. Add 30g of coco powder but they claim that area is bitter. I will bake again. im a baking first timer. i had tried your butter cake recipe. it seemed alright on my second try [im not sure how it should taste/look like anyway]. 1. does it need to be refrigerated for storage? what about for other cakes? 2. also how long can it be kept? 4. what is the difference between evaporated milk, and evaporated filled milk? 5. may i ask, which are the easier cakes which i can try on my next attempt? Can I replace the self raising flour with all purposes flour and baking powder ?? Hi Belle, yes you can do that. Ratio is 250g of all purpose floor to 1 tsp of baking powder. I make the marble cake twice but it didnt turn out well. First time, I use temperature 160c. The top was hard, while the texture at the bottom and inside is wet. Second time, I use temperature 170c. The top was ok, the texture at the bottom and inside is still wet. I use 1/2 cup of evaporated milk. Is it due to too much milk use? Or is it due to other factor? Hi Belle, using 1/2 cup of evaporated milk is ok. Should not be the problem. I guess you will have to cover the top with a piece of aluminium foil and continue baking the cake until the inside is dry. I am using a convectioanl microwave oven. Is there any problem with that. There is a few things i dont understand. Does sifted flour important? What is the meaning of "fold in sifted flour". I mix up all ingridents and mix it in food blender. I don't use mixer. Is that ok? But my cake didn't trun up well. It's doesn't rise at the middle. I dotn know what is the porblem. Can I just use normal white sugar? Pls reply me. I am just started baking and there is a lot of things i dont understand. What is the size of the tray? Sometimes I use 2 loaf tins, sometimes 9 inch. for the marble cake version, could i use melted dark chocolate instead? how should I go about doing it? the top part was hard n cracked.Can i steam them in muffin cups instead? Hi there. I've tried this butter cake recipe and I love it, so does my other family members. Tq for sharing them. i am wondering if i can change the evaporated milk to buttermilk? I just tried to make your butter cake, it was delicious. My kids are loving it. Thanks for sharing. Xavier, I am not too sure but to be more adventurous, you can try out half recipe with buttermilk and see the result. And remember to let me know if you do try it out ok. 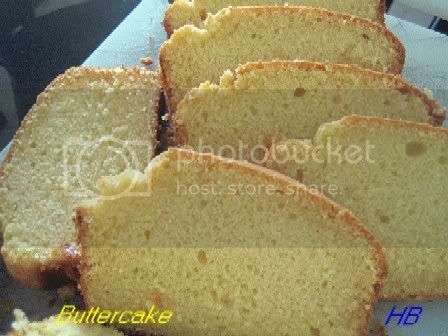 I loved the texture and taste of your buttercake, it is the right kind of cake which I liked. But there one question I would like to ask you for help, as my cake is cooked I noticed that the bottom actually browned and the sides became hardened, is that because of uneven temperature in my old national oven? How will I know? It may be due to your oven temp. What you can do is line the baking pan with double or even triple layer of baking paper (including the sides). I will try that the next time I make it, possibly this weekend, let you know afterwards. By the way, your recipe portions and measurements are perfect for a small family like us, ( Three in the house), thank you. Have been searching for quite a while for something perfect for the past 2 months until I found your site, Now I think I cannot stop checking your site. I made it once and couldn't stop baking this cake.the best recipe that my mum's been looking all this while!thanks for sharing. hi. may i know what is evaporated milk? i tried to find it in ntuc, but can't find it. is it the normal kind we use to stir into milo? given,how much baking time is required?Any advice as it would be such a waste if I increase the recipe and it doesn't turn out right! I have tried this out last weekend. I replaced self-raising flour with superfine flour + 1tbs baking powder. The cake taste not bad, but the texture seems rough and dry. Is the flour replacement the main cause of this failure? tried your butter cake last week. my family member all love its. but the cake top crack any advice? It me again. I tried baked the ckae again ytd nite and i give to my colleagues they all love its too:) Thank you for sharing the receipe. But i stil have the same problem w cake top cracked. how to avoid the crack? Shirley, I wonder if we do the steam baking method will it prevent the top from cracking. I have no idea how to prevent it from cracking. Kelly, yes you can use normal sugar, ie fine sugar, make sure it is not the coarse type. Lim, wow 3 or 4 x the recipe will be a lot. You are going to bake them into a few trays? If not it will be a huge cake, won't it? Really no idea how long as I don't know the size of your baking tin. Hi Miss B, thanks for giving me the link and of course you are welcome to link to my blog too. Hi there! Thanks for sharing, I don't like those random recipes from internet. You never know if it works! (It isn't in my last trial.) Mum's recipes is always the best!!! Thank you! would like to try your buttercake. can i replace self-raising flour with cake flour ??? if i want to add in green tea powder, do i need to reduce flour by the amount of green tea powder i use?? ?